Make sure you optimize the images so the files are as small as possible, especially if you are using a carousel containing several. If in doubt about sizing and optimizing images, please get in touch with falcon-support@uis.cam.ac.uk for help. add a caption for the image if you want. It will be added on a 50px high black band overlaying the bottom of the the image. Add image title (which will be shown when the pointer hovers over the image) and the alt text for the image. Either could contain the credit for the photo – the alt text ought to be descriptive for those who use a speaking browser. add either an internal or external link for the image – this is where the user will be taken if they click on it. To add another item, go to the pop-down menu again, so you build up a list of items. If you want to delete an item, click on the orange cross on the right of the line. You can deselect items for the carousel by clicking on ‘hide’ to rotate a selection, and you can reorder them by clicking on the arrowheads. The portlets shown on the right side of the home page will be inherited through all folders and pages unless this inheritance is blocked. It can be useful to consider this when laying out the home page. Calendar portlet: Adds the standard Plone calendar. Collection portlet: Collections are dealt with in a separate session. Events: Along with separate but similar portlets for News and Jobs, this portlet collects the titles of Events and displays them as a list with a link to the full entries. If you add an Events portlet you can select how many items to display - you should leave the Workflow state as configured, unless you have special reasons to do otherwise. Feedmixer and RSS Feed: These portlets are both for adding RSS feeds to your page. The first allows you to mix two or more RSS feeds together, while the second allows you to just insert one feed. When adding a Feedmixer portlet, since the links for the different feeds look the same, you need to be careful that you give the portlet an accurate title. Be aware that there may be quite long titles and displaying more than 4 or 5 items could take up quite a lot of space. To add a single RSS feed portlet, the set-up screen is very similar but only a single rss feed can be added. Do be aware that this publishing system will not publish badly structured feeds - the Feedmixer portal will not work at all if one of the feeds is badly structured. The RSS portlet has been set up to recognise RSS feeds from talks.cam and alter the footer text accordingly. Additional information is available about finding the URLs of RSS feeds is available. Link box: To create a link box you just need to add the URLs and link text to the portlet. The order of the links can be changed by moving lines up and down with the arrow icons. Recent ploneboard conversations and Review list: These portlets will only work either if you are using ploneboard or if you are an admin user who moderates other user's submissions. They are included in the right-hand column but aren’t appropriate below the content. Static text portlet: This is useful if you need to make a long-term announcement or add a block of text that refers elsewhere for full information. A static text portlet can be used to add just an image or to add an iframe. If you add an iframe into a static text portlet you need to paste the code while the wysiwyg editor is in ‘html mode’. Teaser portlet: This can be used instead of a static text portlet as it is better formatted, with a specific size of image it expects. oEmbed portlet: Allows you to display external content such as the University map, or a video from the Streaming Media Service, YouTube or Vimeo. All you need to do is add the URL for the content. There is an option to display the title of the portlet and some text or omit it. Because the portlets in the content area can only be added to the home page, you do not have to worry about the settings in the 'Block/unblock portlets' area of the page. When portlets are used in the right hand column these settings are important: if you don’t want inherited portlets to appear in a folder, select Block against ‘Parent portlets:’ and then save the settings. 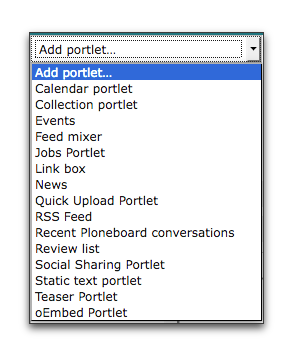 Leave the ‘Group portlets:’ and ‘Content type portlets:’ settings as they are. you can replace the ‘Read more’ link with other text if it is more appropriate. As usual, you will need to save the item – you will then see that item listed under the teaser heading on the home page portlet management screen. To add another, repeat the above steps. When you have added some more, you can reorder them using the arrowheads or hide some of them (by clicking on 'hide') to change a selection. You add them as detailed above.